When produced using renewable energy sources, such as wind, solar or biomass, hydrogen has the potential to be a truly zero-carbon transport fuel. UK H2Mobility’s consumer research and the UK’s carbon reduction objectives both demonstrate the importance of securing low and falling carbon dioxide (CO2) emissions from Fuel Cell Electric Vehicles (FCEVs). FCEVs produce zero CO2 when they are being driven. However, the calculation of the overall carbon footprint of FCEVs also needs to take into account any CO2 emitted during production of the hydrogen fuel. When produced using renewable energy sources, such as wind, solar or biomass, hydrogen has the potential to be a truly zero-carbon transport fuel. Even when the hydrogen is produced using fossil fuels, FCEVs can significantly reduce the overall amount of greenhouse gases and pollutants generated, compared with those emitted by conventionally-powered vehicles. In order to compare the carbon footprints of the various fuel options, UK H2Mobility project members included a range of different production technologies in the roadmap. Among them were technologies that are at least as competitive as other advanced low-emission vehicle technologies in the early years, and that are on a plausible path to full decarbonisation by 2050. 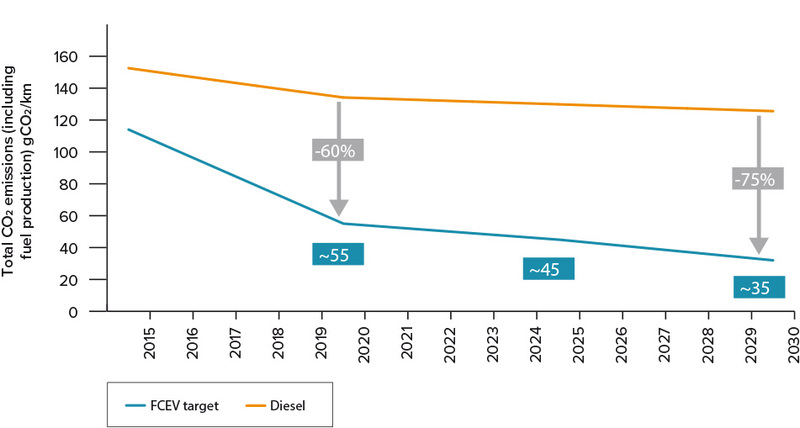 Using the project fact base, the analysis shows that a mix of hydrogen production methods can deliver hydrogen to the driver at a cost competitive with diesel, yet with 60% lower CO2 emissions in 2020 and 75% lower in 2030 (see Figure 4). In 2030, the roadmap shows that the national annual demand for hydrogen for FCEVs will be 254,000 tonnes. 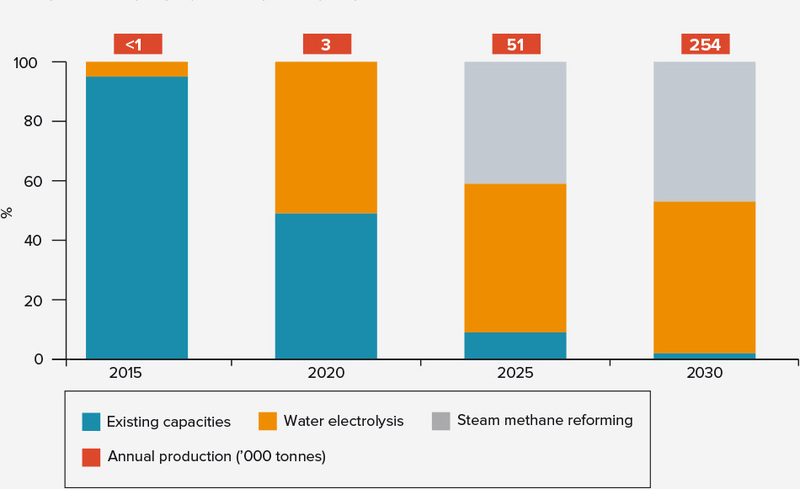 The hydrogen production mix in the roadmap for 2030 is forecasted to be 51% water electrolysis, 47% steam methane reforming (SMR) and and 2% existing capacities (existing capacities are a mix of SMR and readily available by-product hydrogen from other processes). The water electrolysis, using renewable electricity, includes both on-site production at the Hydrogen Refuelling Station (HRS) and centralised production with distribution to the HRS. In 2030, the roadmap shows that the national annual demand for hydrogen for FCEVs will be 254,000 tonnes (see Figure 5). Water electrolysis capacity offers significant benefits to the electricity sector in assisting the integration of renewable generating capacity and in providing grid-balancing services. These benefits will increase as the proportion of renewable energy in the generating mix increases. The project quantified these benefits and determined that this would have the effect of reducing the cost of hydrogen produced by electrolysis by 20%.